It’s been a changing moment…or is it just one point that I’ve arrived at before, started and then found a different direction. Are we ever happy with the now? I’ll do that when…I’m feeling happy, when I’m ten kilo’s lighter, when I meet the right person, when! , when?, when. Let’s just start living the now. I’m at this point again, lift my head high and face the music, however this time I’m writing the music and my own lyrics. Start enjoying every little ‘moment’. Enjoy the company of family, the company of friends, but most importantly know who that person in the mirror really is, the reflective you. With all the extra lines of time, the freckles, the blemishes. My journey with Kim Klassen and Beyond Layers, ( Beyond Layers II registrations now open) has been just that a journey of peeling back so many emotions, so many feelings, grasping for air, a ray of sunshine or a falling tear. Beyond Layers is 52 weeks of encouragements, affirmations and motivations. Funny how sometimes the universe tells us not once but more than once. Not only had arrived my weekly lessons from Kim, but I also received my daily email from Bravegirls club. What was a little bird telling me today? Is there always some idea, a dream that you have always wanted to do, something you’ve wanted to see, somewhere you’ve wanted to go. Now, is the moment. Now, is the right time. We all have the potential to reach our goals, break down the barriers and face our fears. Reach for our dreams and live today. We are all beautiful, we may not be perfect, but we can start today to be more bold, true to ourselves and make our lives more meaningful. Today’s Challenge was to create an image with one of Kims ‘Beyond Layers’ affirmation brushes and/or textures. I used the affirmation “You do not have to be perfect to be beautiful” and the texture:’I am’. I’m not one to take a lot of self portraits, I usually hide behind my camera, and it’s the first thing I say when anyone else takes a photo..’Can I see’ …so my self portrait was not an easy challenge for me today. But hey!, a stepping stone and beyond another layer. Well done Yvette – a beautiful self portrait! I too am more comfortable behind the camera and always seem to find excuses too – sad that we do the when’s…instead of the right nows! Jain, it wasn’t an easy task,but I took this challenge on with courage to build a stronger character and grow beyond another layer! You really are beautiful, Yvette. A very lovely photo or you. And I know exactly what you mean. You put it so perfectly. The power is only in the NOW, and that’s where the ‘whens’ are created. So let’s make them good, positive, loving ‘nows’. 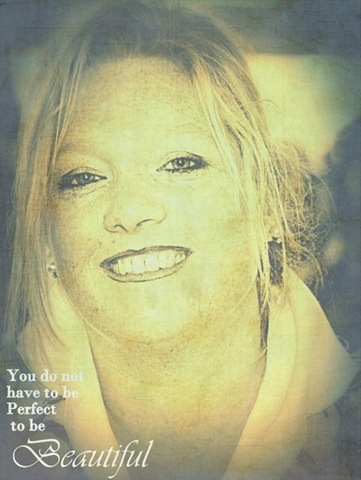 We are already pefect in spirit…when we remember that then perfection comes from the inside out. I am so proud of you and jealous. I hate photos of myself and started realizing that our family albums are almost void of me, their mom, altogether, and it’s my own doing. I really need to get over the 10 lbs lighter mentality that you speak of. Thanks for sharing and giving others encouragement to live in the moment to the fullest. 🙂 Have a happy day. Oh, Yvette, you are really beautiful!! I love your self portrait! Great smile and beautiful eyes!! You are learning a lot from Kim and I so enjoy your blog. There are so many truths in this blog. So much good advice in one post, Yvette, with “living in the now” perhaps the most important. Master that and life gets so much better. Now that’s a portrait of a happy, confident young woman. Well done, Yvette!